I went into library school thinking I was going to be an academic librarian, but I realized I was more interested in how people feel and think about tech. Right now I work for SoundingBox, which is a UX research and strategy company. One type of research I do is competitive testing. SoundingBox is also our user testing tool that we have been using in house for a couple of years but will be released out of beta this summer. With the tool, we capture behavioral measures (clicks and scrolls, for example), ask different types of questions (open ended, scale, multi-select), and observe what people do. When running a competitive test using SoundingBox, we typically collect data from ten or more sites in one study. We provide our clients with experience metrics, and the deep dive reports are really useful for our clients, too. One example of how our client used the insights produced by SoundingBox was to plan for the next fiscal year, including where to focus attention, how digital fits with overall strategy, make the case for staff and third party consultants in the coming year, and to track and communicate success.  Coming out of Pratt, I would say I had a good foundational understanding of usability testing, but when I started out professionally I had never done this type of competitive testing before. I have been able to learn so much and I’m continuing to learn, which keeps the work exciting! I’m also leading most projects now. One thing that entails is moderating user testing sessions. Moderating is a skill that takes practice. The more sessions I moderate, the more I learn. I like to ask mentors for feedback and am constantly thinking about how to improve (by asking different questions, changing the ordering of tasks, etc.). In what capacity do you interact with UX designers? It depends on project. Sometimes we work with marketing or advertising teams, sometimes with design teams and design agencies directly. Our process starts with the research stage. For example, we’ll screen participants for recruitment and create a discussion guide, followed by conducting the research. The research can be in-person moderated labs, remote unmoderated, or competitive studies, for example. We work collaboratively with our clients on design questions and figuring out how to implement the research findings or plan for a next round of testing. Sometimes they’re interested in testing one particular feature to evaluate before they build it. It can go anywhere from 2 weeks to a month or more. Sometimes we’re working with really strict deadlines or the client is working in short sprints where they want research to move to next stage of design. What is your favorite (and least favorite) part of your job? I love moderating. It’s one of the reasons why I got into this field. I like talking to people and I think it’s really interesting to hear how people think and feel about technology. I also like that we’re thinking about how we can design technology that’s meaningful and has a positive impact on people’s lives. Client-facing work is fun, and it’s always fun to work with teams that really care and want to improve. Competitive stuff is really fascinating, too. I feel like I’m always learning so much and feeling challenged. I love seeing what’s resonating with people and why a site is a poor performer or top performer. At the end of the year we do a roll up of all the data for a best practices deck, and the high level insights are interesting, too. In terms of least favorite, a lot of back and forth goes into managing projects (which is necessary, but can be annoying). I handle most projects from start to finish, communicating with vendors, recruiting participants, doing the research, etc. This is probably pretty normal for UX teams since they’re usually small. What advice would you give to someone entering the UX field? I recently did a workshop at Pratt with a colleague who went into public libraries. We talked about how to get a job as an information professional, and what I like to tell people is to always just apply even if you don’t have all the requirements listed on the posting. Most things employers list in job postings are really wishlist items. Even if you don’t get the job, at the very least you’re getting interview practice. I also encourage student to keep up with their portfolio. I wish I was better about doing my portfolio as I went along (at Pratt) when the projects were still fresh, because I feel like I missed some of the nuances that happened. The Pratt UX program seems a lot more built out now compared to when I was there. Students seem to have more access to professionals working in the field which is something to take advantage of! One piece of advice for students is be confident. But, be willing to learn. Don’t go into a new job thinking you’re the expert. Be curious and open.